Well, that saying and the reverse of it in relation to March weather always seems to hold true and this year was no exception. 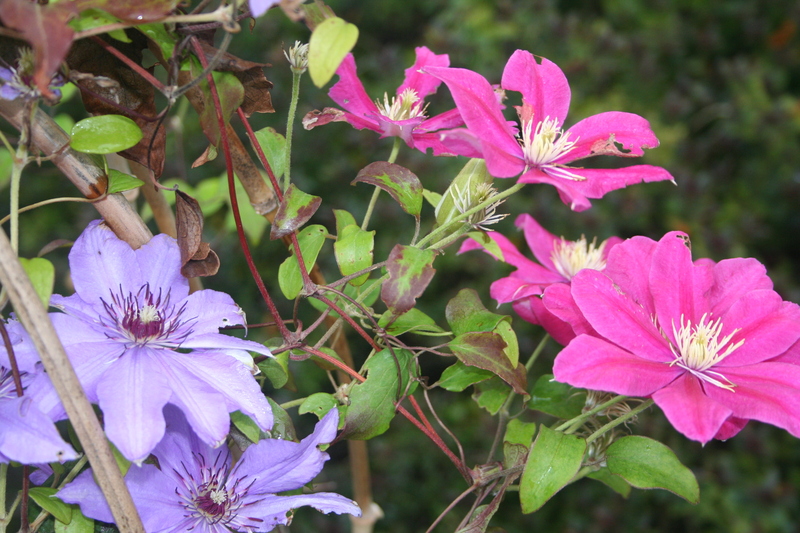 As I write this, the weather is benign in the garden; a lot different to the start of the month. 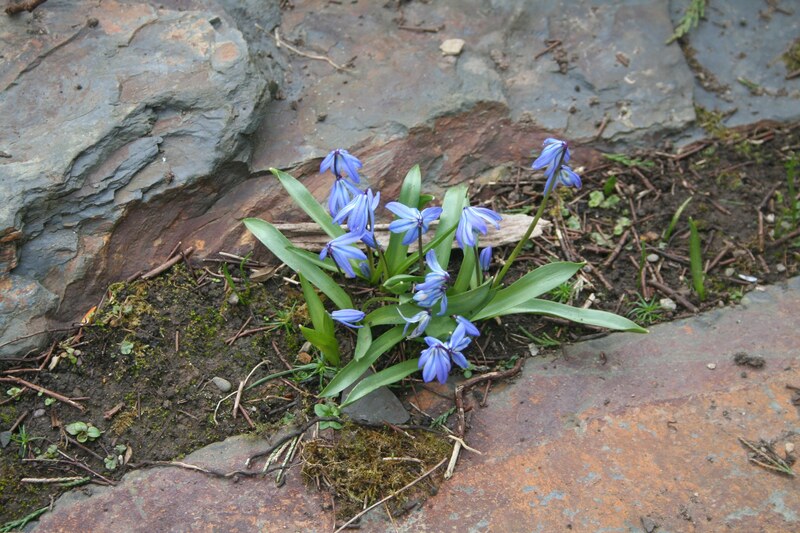 The cover picture is of Scilla siberica, in among Namurian rock. 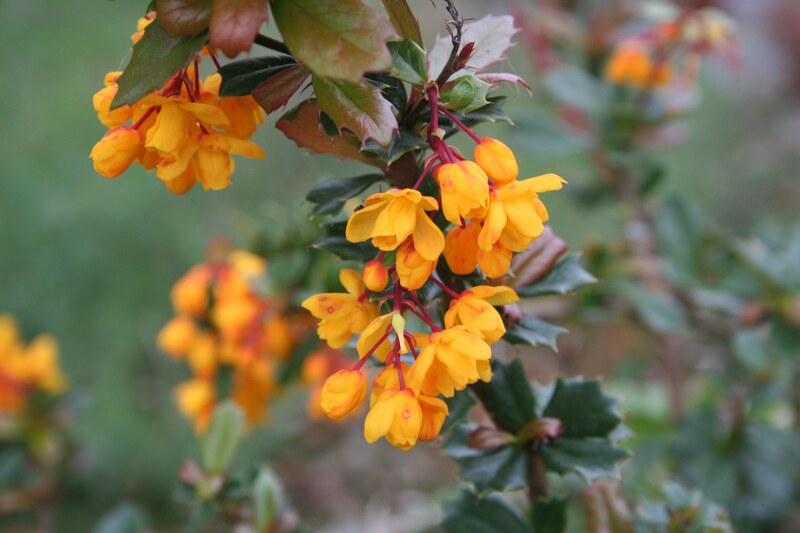 The two pictures above show Berberis darwinii and Drimys winterii, both putting on a show for the whole month. 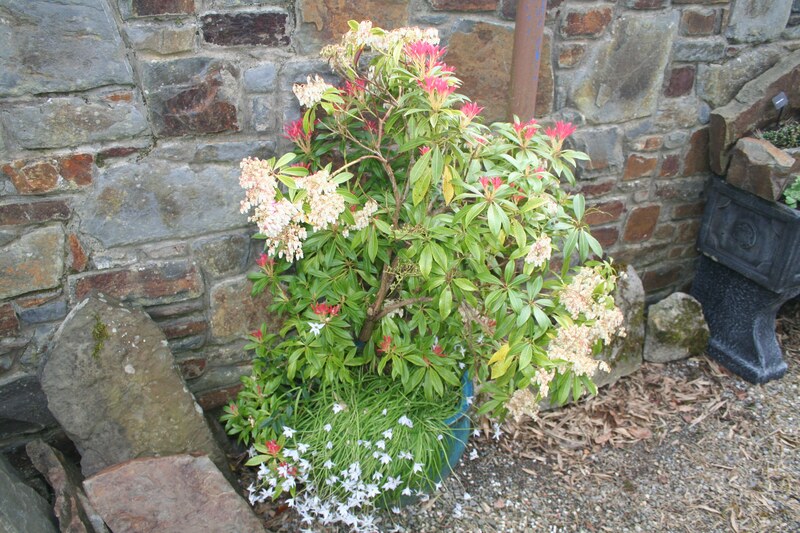 And then, these two pictures show Sebaea thomasii “Bychan” and Pieris “Forest Flame” with Chionodoxa “Glory of the Snow”. 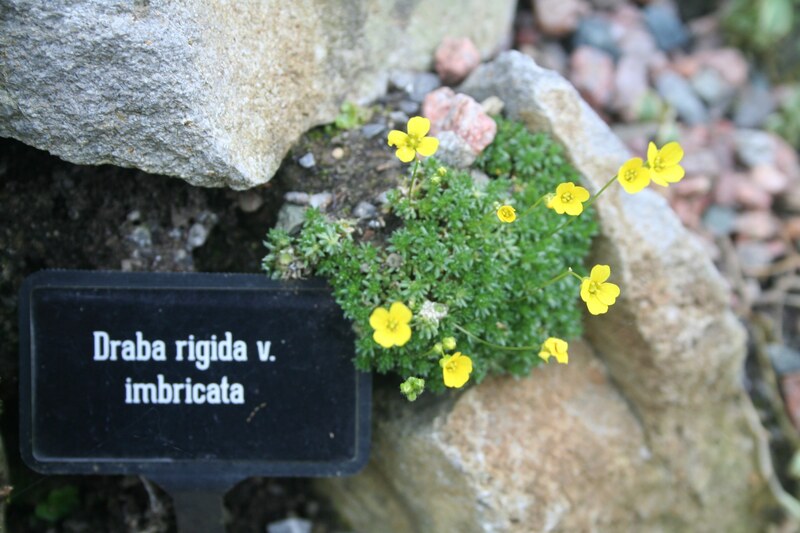 A Draba growing outside in a trough. This part of the pond had been invaded by Horsetail last summer so a digger was brought in to remove the pondside soil with unfortunately all its riparian plants. 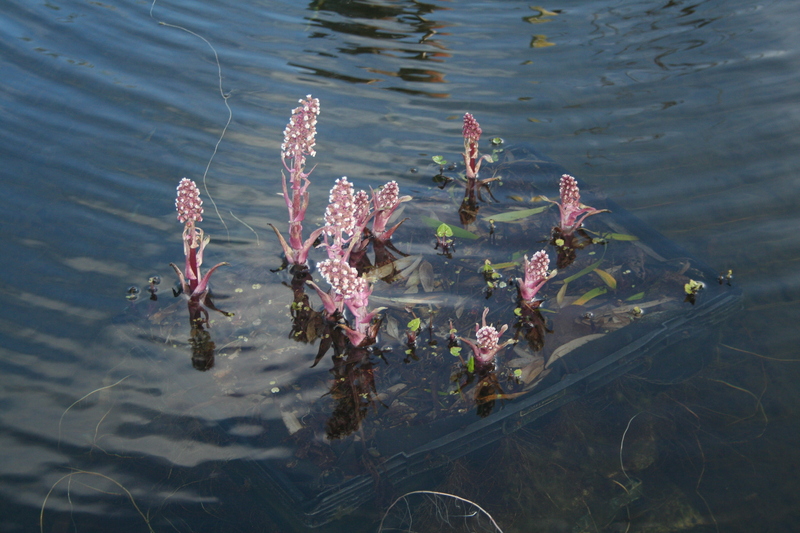 Hopefully the remains of some of the plants will surface about the water this summer. 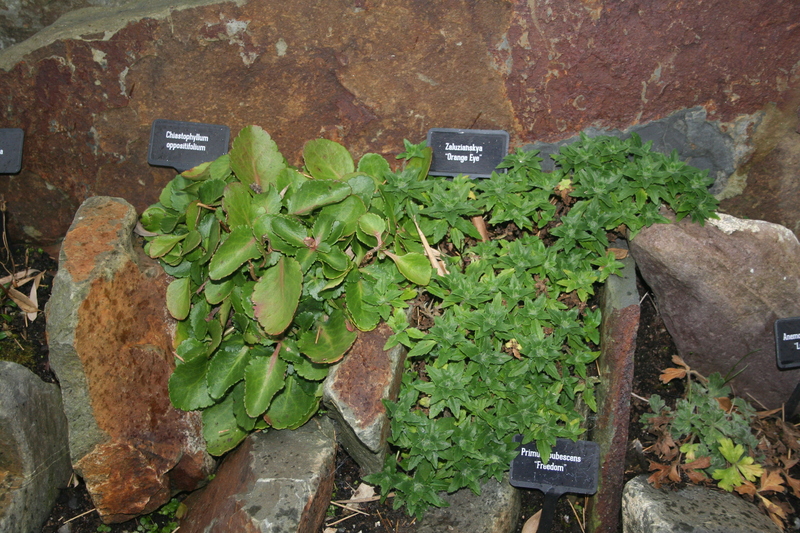 Below is one of them, Butterbur in a plastic tray. 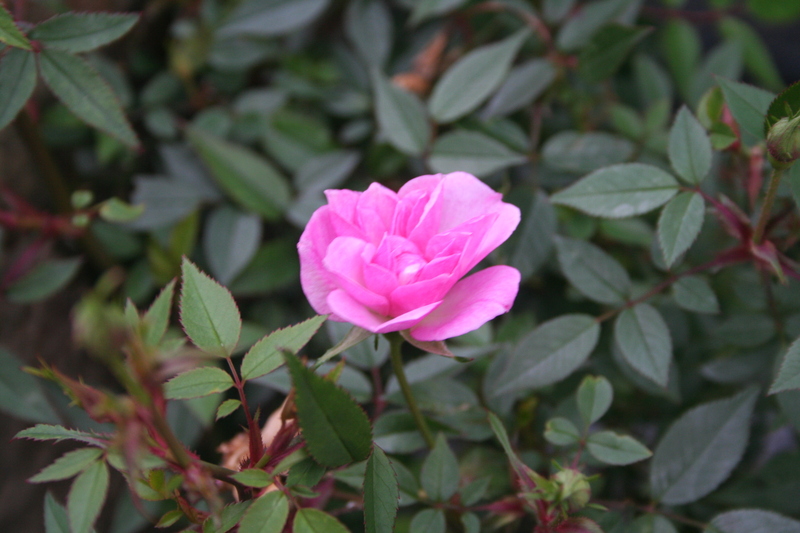 The flowers always arrive before the leaves. 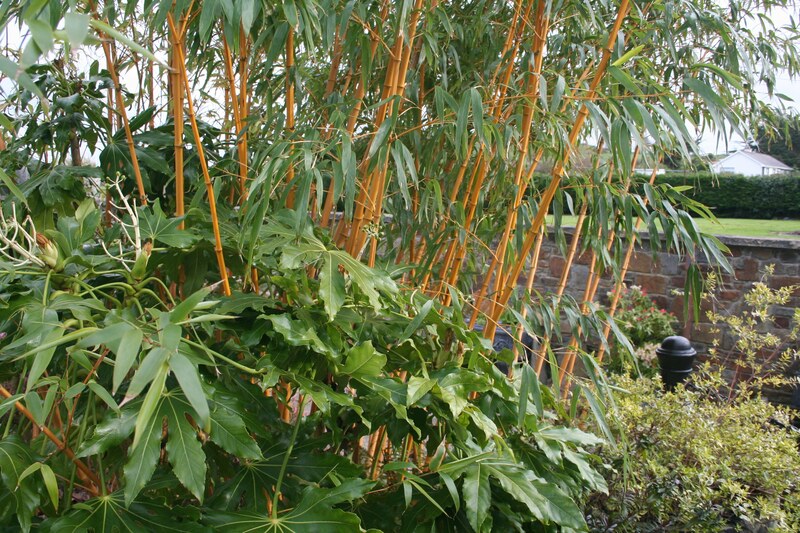 Phyllostachys aureosulcata aureocaulis provides a lovely wind break and protects a Fatsia japonica behind it. 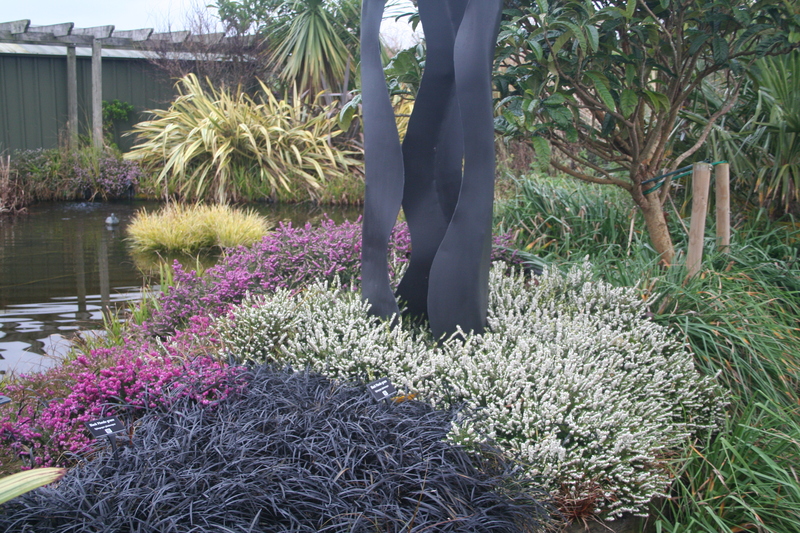 Well February was 2° warmer this year than its average and it showed in Coolwater Garden, with plants delighted with the weather. They will have a rude shock at the beginning of March, though, with very cold weather forecast. 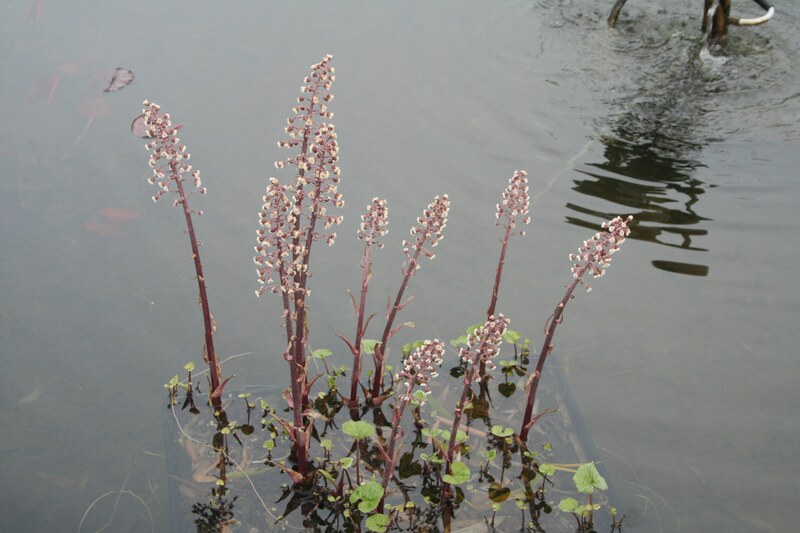 This is a Butterbur in the water garden, which flowers before the foliage appears. 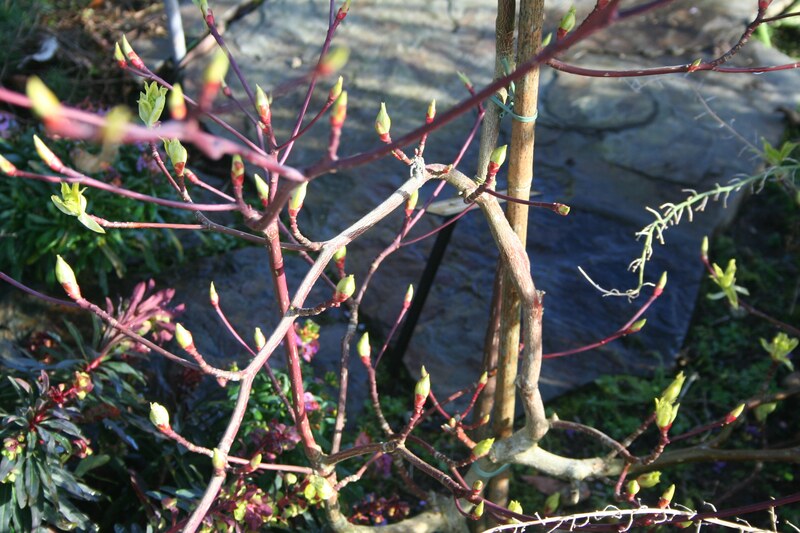 And lovely buds on this Wedding Cake tree. 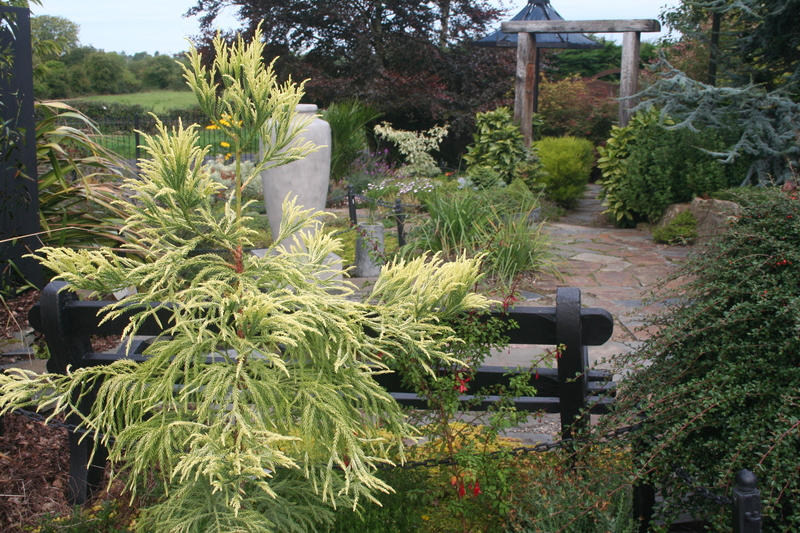 I planted it instead of a Canary Island Date palm, which suffers the effect of cold winter winds defoliating the fronds. 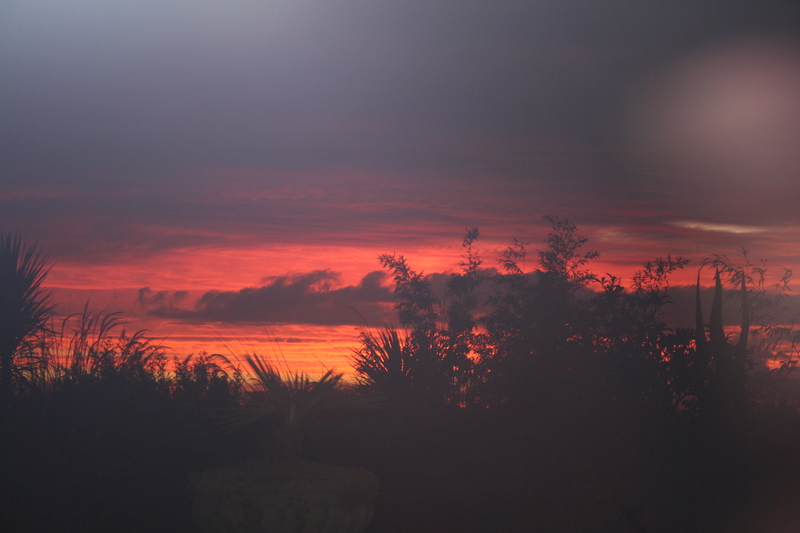 After I’d chainsawed the palm down to the base, Lo! And Behold! 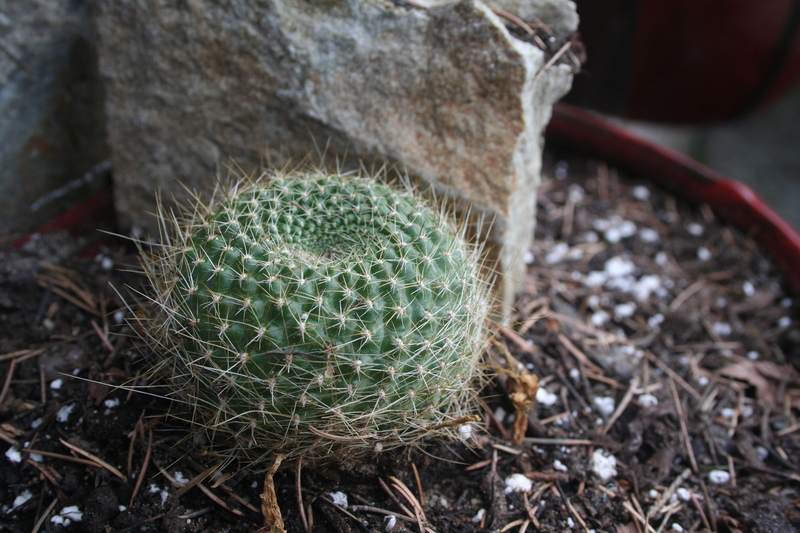 it shot up four feet high from below ground level in eight months. Talk about wanting to live! 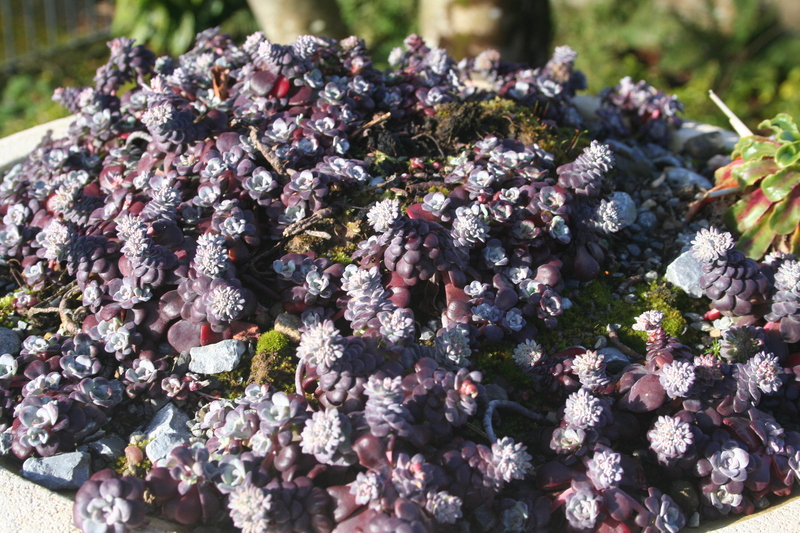 Beautiful dark foliage on this Sedum spathifolium purpurea, much admired by everyone. 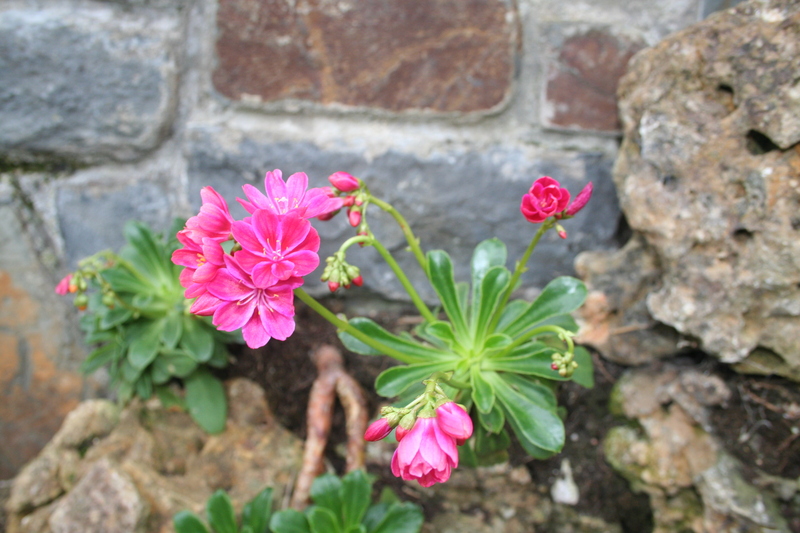 And, lastly, saxifrages starting to flower in the tufa rock. 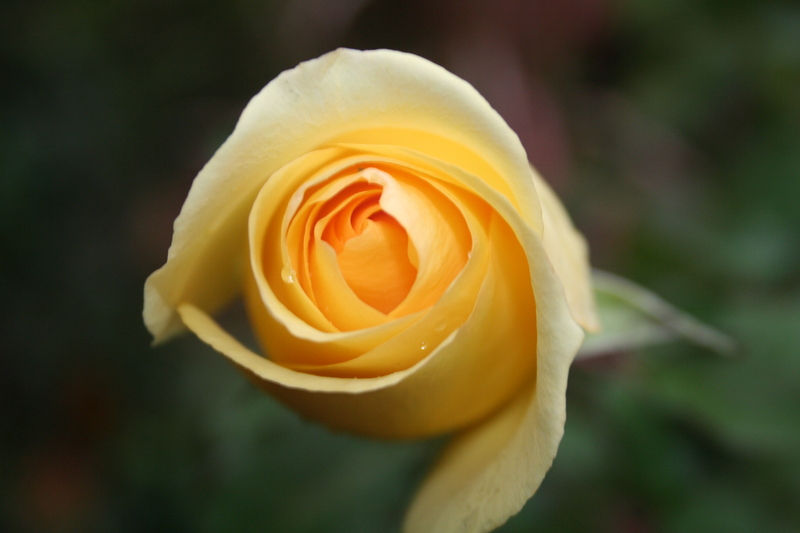 Writing this on the 21st, the two-faced, Roman god of January has treated us well in the garden so far, it having been unusually mild, with precipitation at only 20% of average, although sunshine has also been low, averaging at 30% of normal. A colder end to the month will even things out a little. 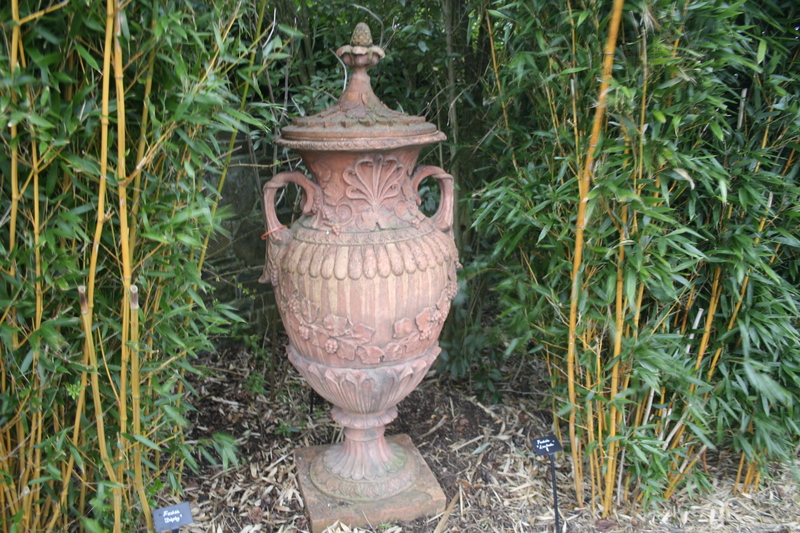 The cover picture is of an antique terracotta urn I picked up in the North last week and is now ensconced in a bamboo grove out of the wind. I really love the detailing on it. 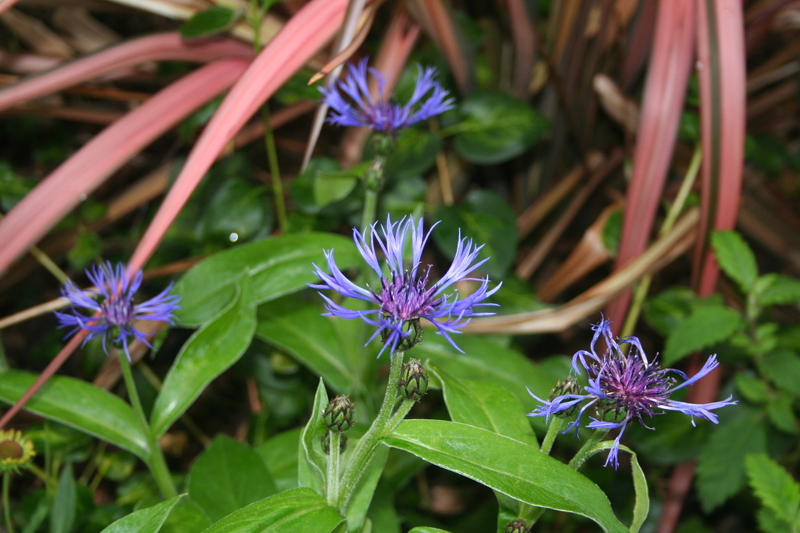 Below are pictured two plants bringing colour to the West Garden. 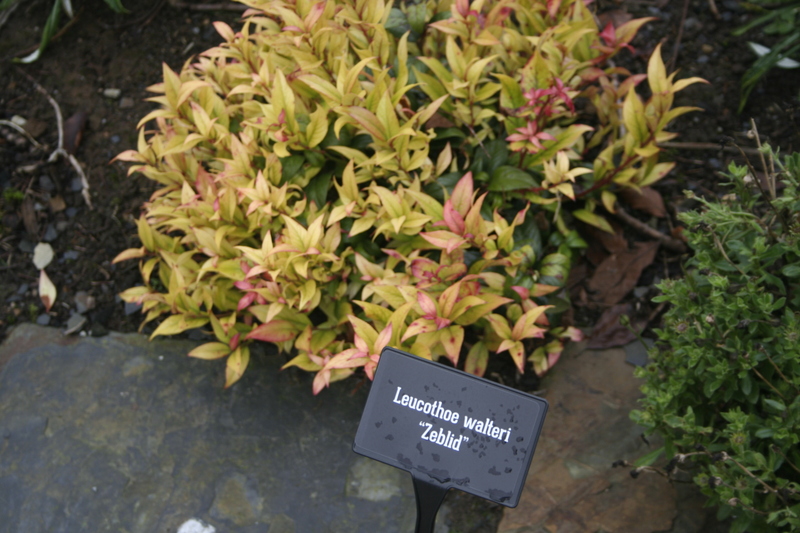 A Leucothoe walteri “Zeblid” and a Photinia “Pink Curry”. 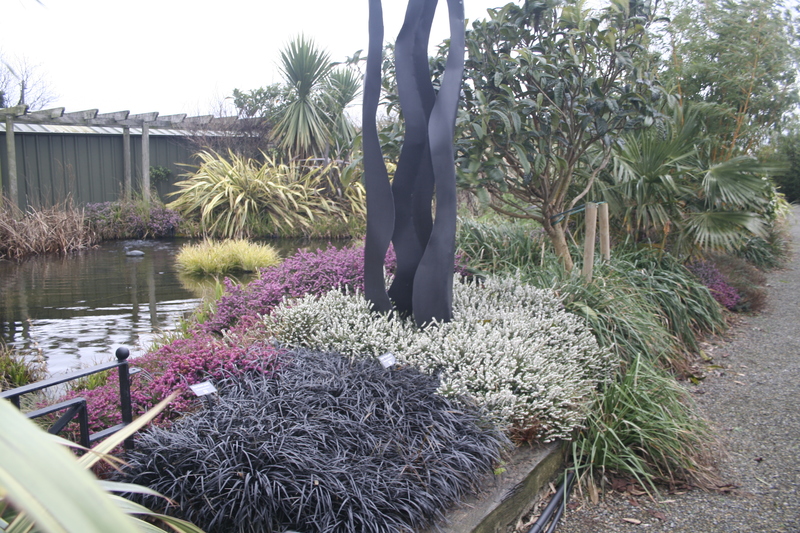 Around the riparian sculpture has been planted Black Mondo grass and winter flowering Heathers. 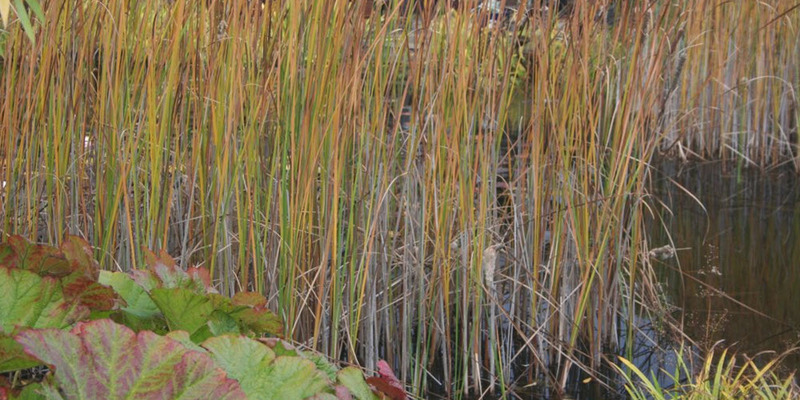 This time of the year, it certainly brightens up the waterside, when reeds and bulrushes are dull with brown. 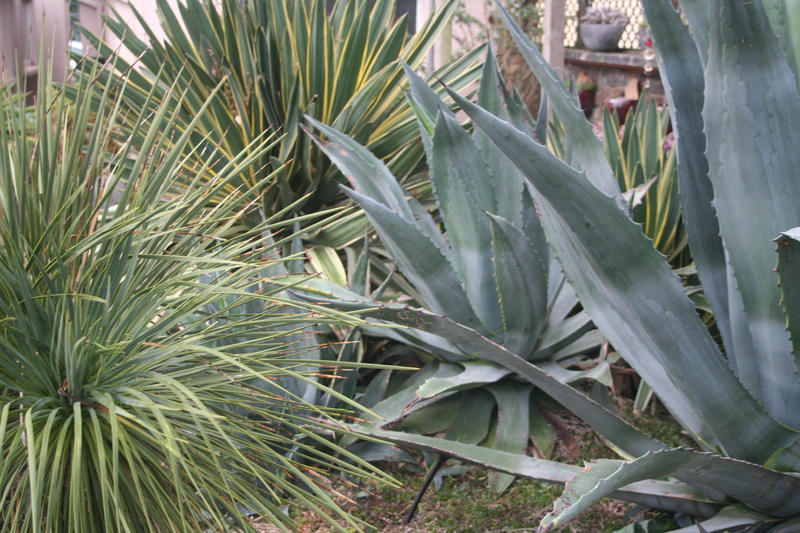 Over in the Xeric bed, there has been humongous growth with the agaves. 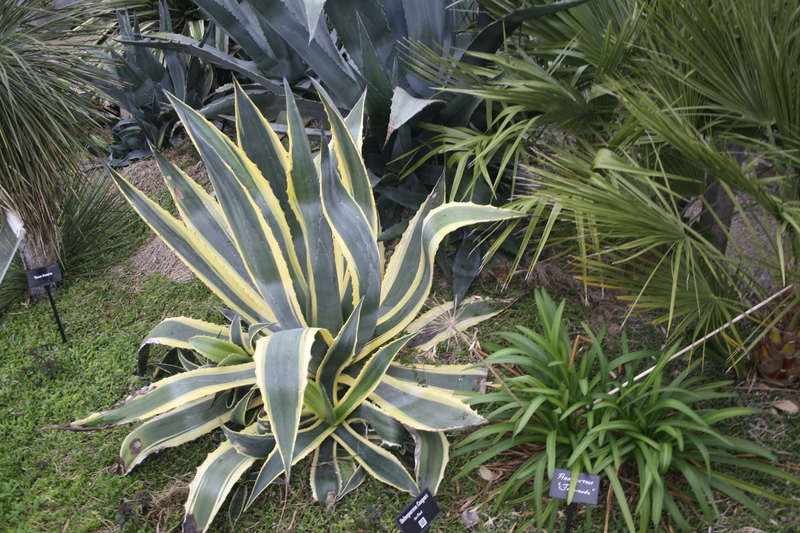 This Agave americana variegata has certainly put on quite a spurt recently. 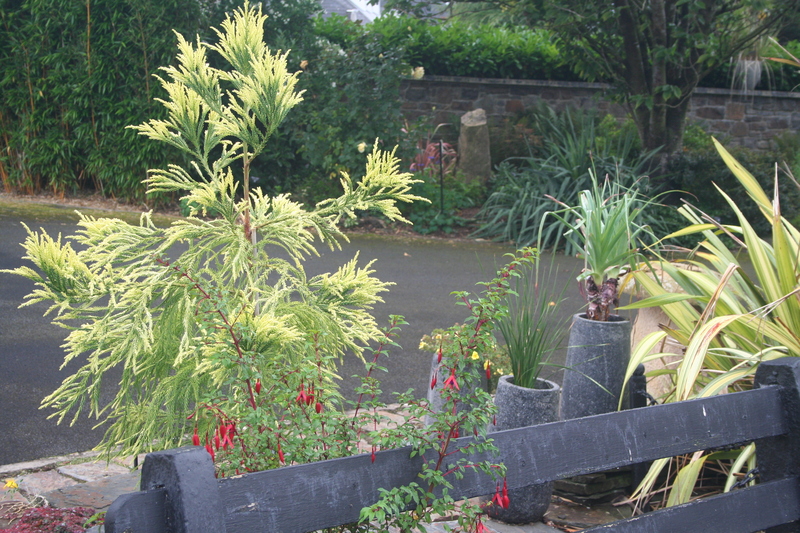 Alongside it, but out of picture, is a Yucca linearis, really thriving as well. Well, 2018 has drawn to a close, a year with no Spring and yet one of the hottest, driest summers ever. It was a good year, though, for Agaves and Yuccas, all of which grew enormously this year with the Yucca gloriosas putting up fabulous shows of flowers. 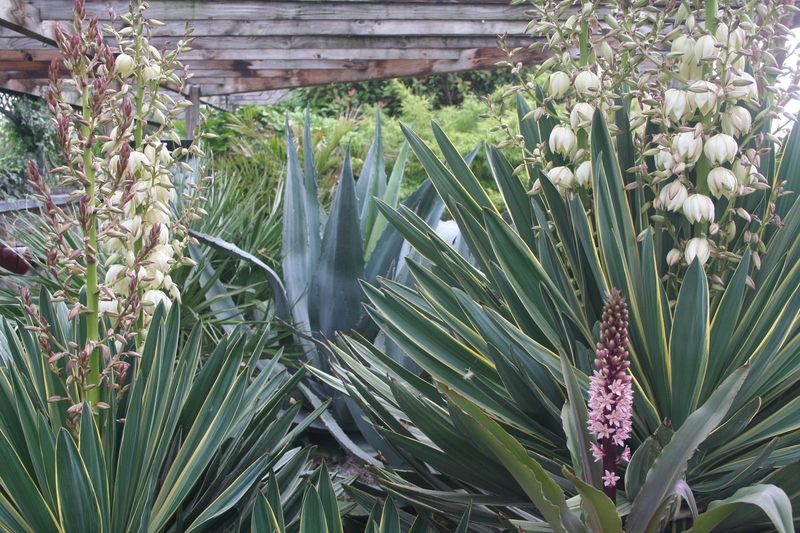 Yucca linearis’ flowering show wasn’t too shabby, either. 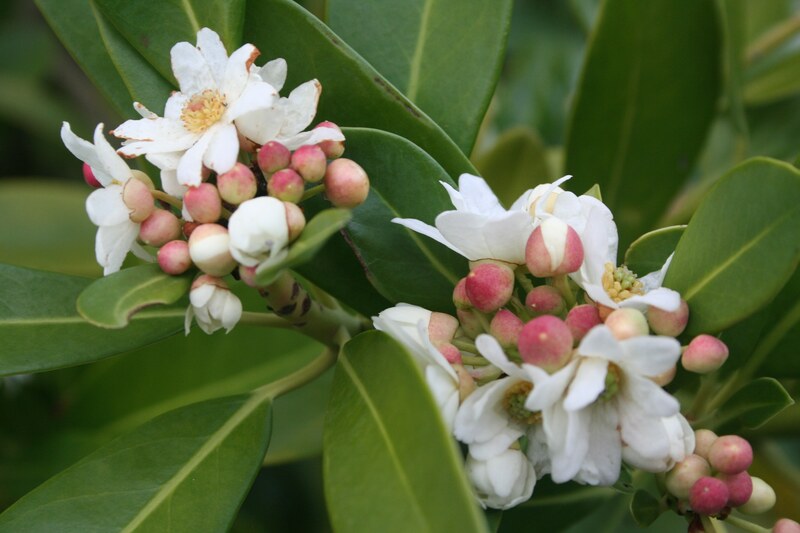 We have an Omeo gum planted and the intention is to feature its juvenile leaves by keeping it pollarded to under 12 feet thus preventing the less attractive adult foliage from forming. 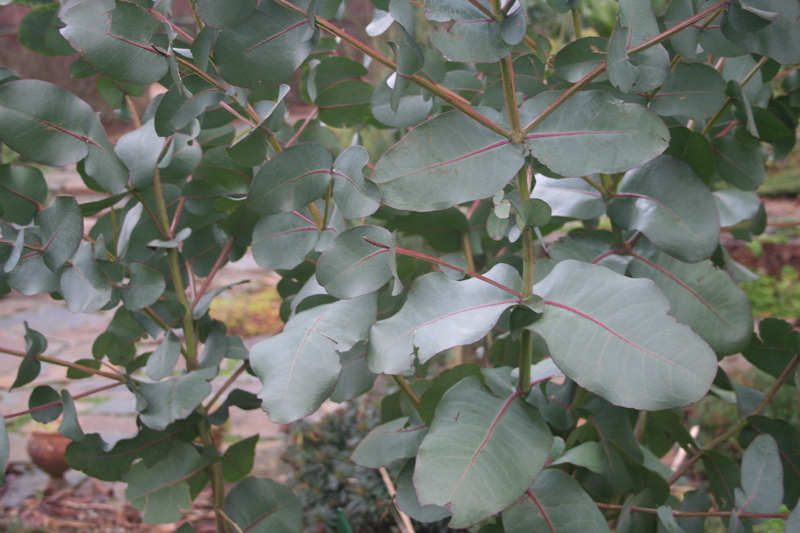 Our uncommon Eucalyptus sturgissiana, planted at the same time, is also doing well, thank goodness. 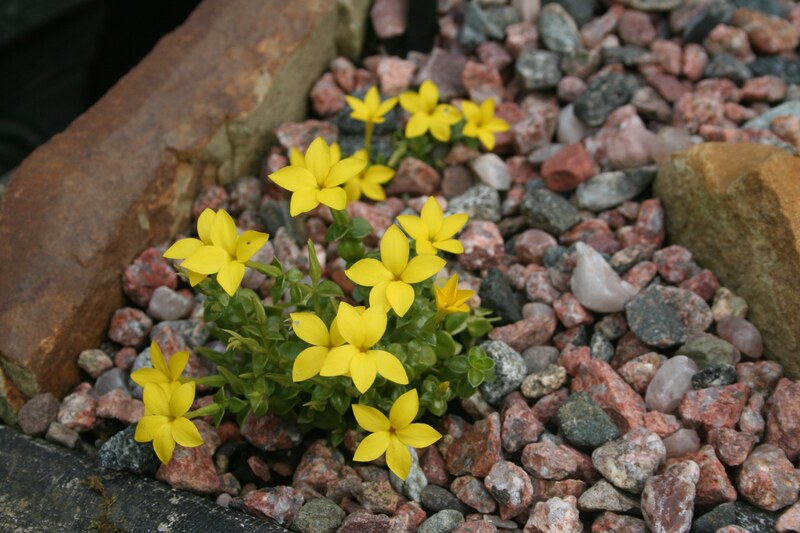 Below is our yellow sandstone standing rock, which we got from Knockfierna. Knockfierna is named after the fairy king, Donn Firinne, and commands an all-encompassing view of Co. Limerck from the top of its height. 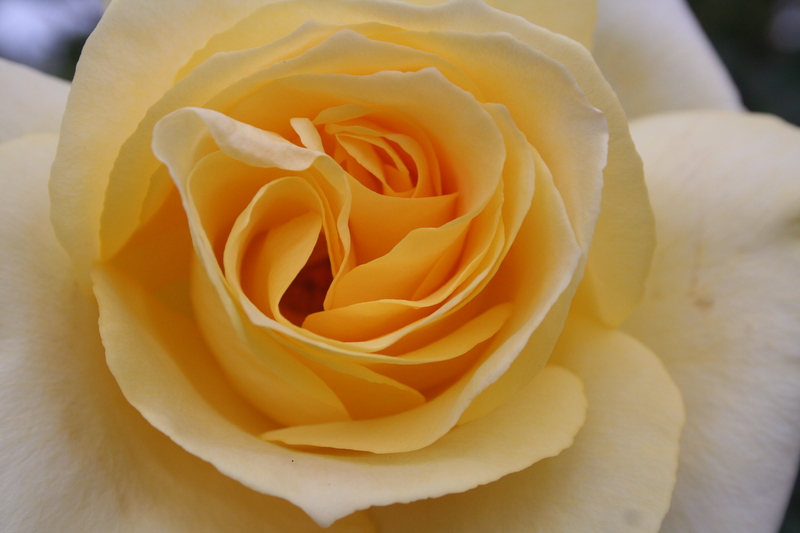 This coming Spring we are going to make “Super Soil” (or, we hope………… we’re going to make super soil. 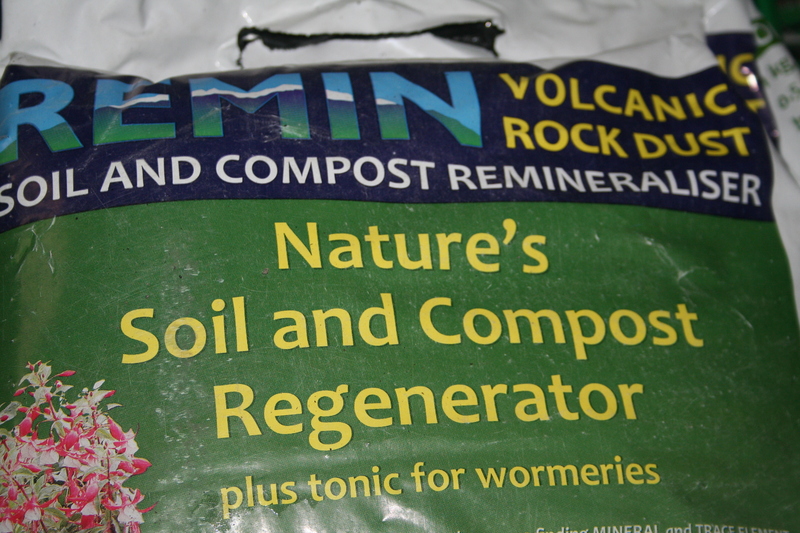 🙂 ) from compost, organic farm manure, volcanic dust and Biochar. 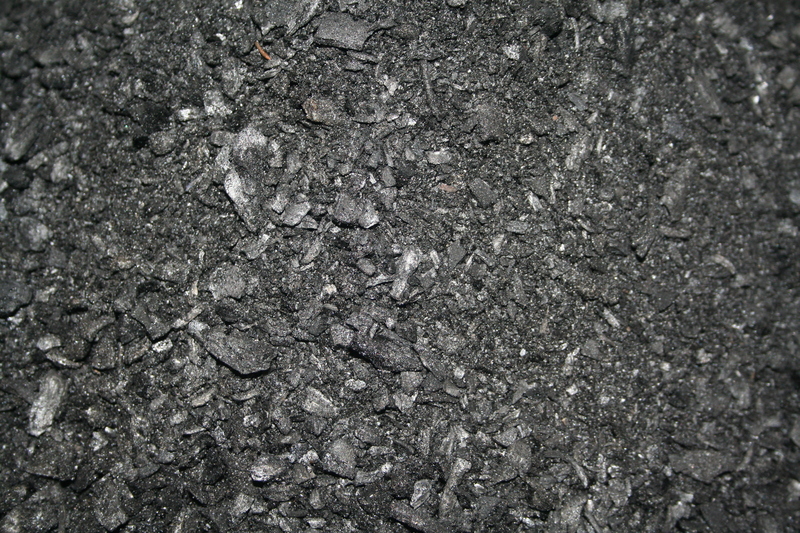 Biochar and Volcanic rock dust pictured below. Time will tell as to how good it will be. 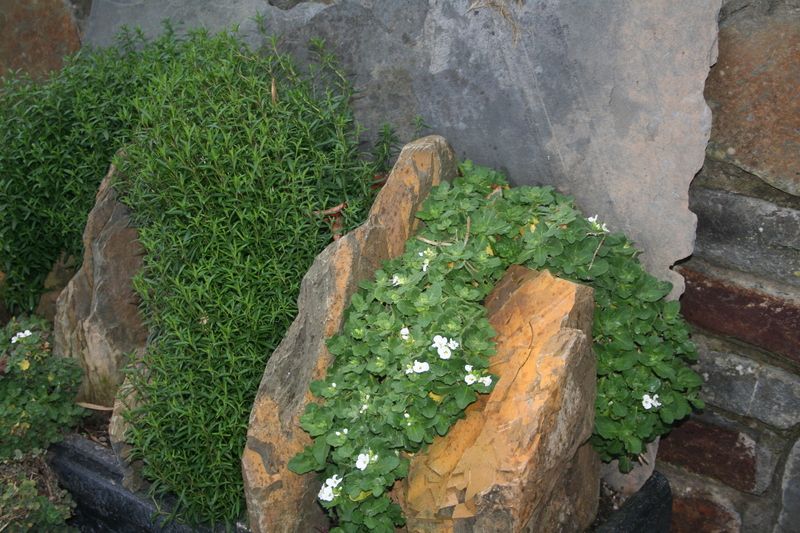 With sound of rain on the patio windows akin to someone dashing sand at high speed against the glass and looking outside to see swirls of wind whirling the stands of bamboo this way and that, I thought it a good time to sit down and write a little bit about the different types of rocks in all the troughs. These rocks were mainly stolen, (sorry, given), 🙂 from various friends and local quarries. 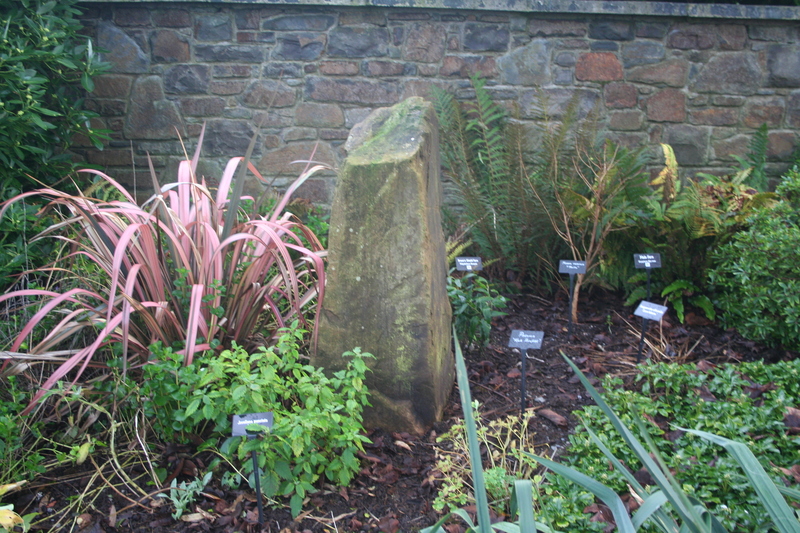 The featured photo is of the slag rock from the Killaloe slate mines. 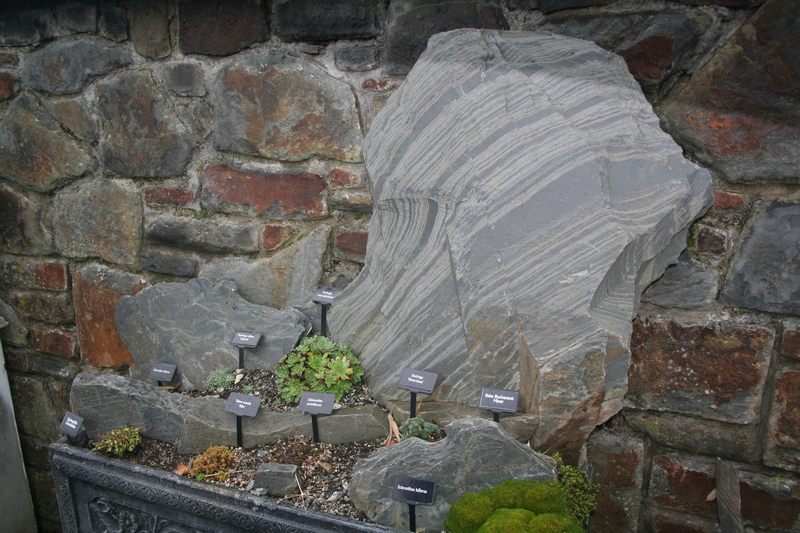 These pieces wouldn’t split right for the slate makers and were discarded in massive piles. 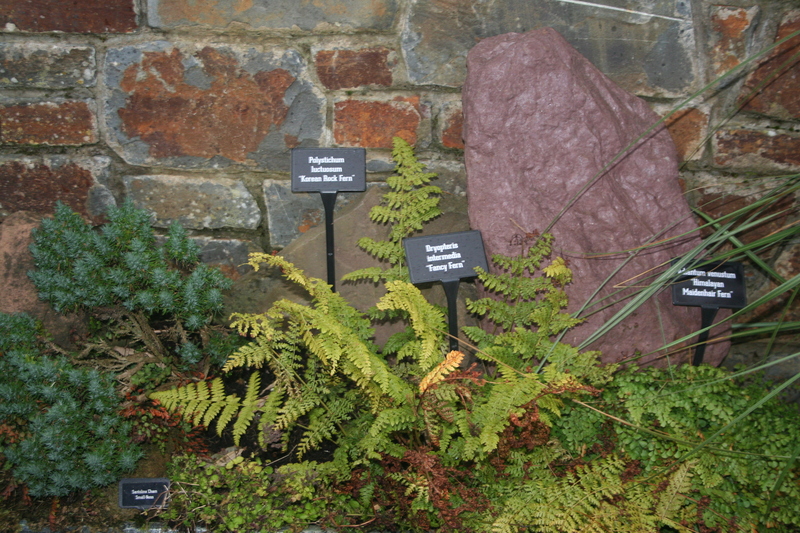 Below, is a piece of Devonian Red Sandstone from the Ballyhouras, which complements the greenery of the ferns. 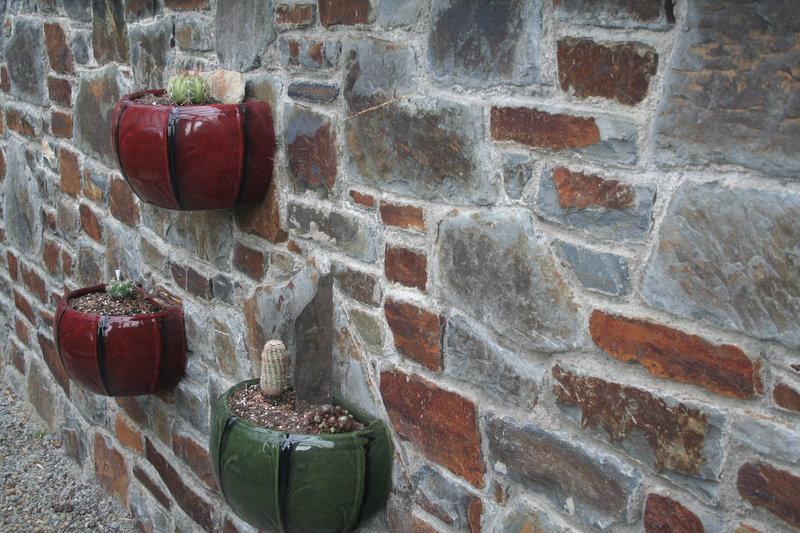 The wall behind is made of Namurian Shale from Castleisland, which I didn’t steal but bought from a farmer in Kerry. This, below, is Carnoniferous Limestone from bedrock broken out, when foundations for a new house were being put in in Corofin, Co. Clare. 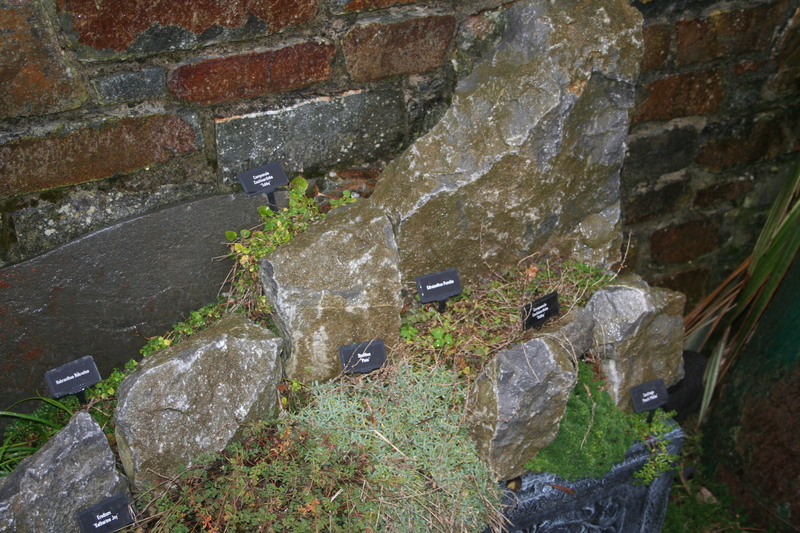 This rock is the basic building block of the Burren. 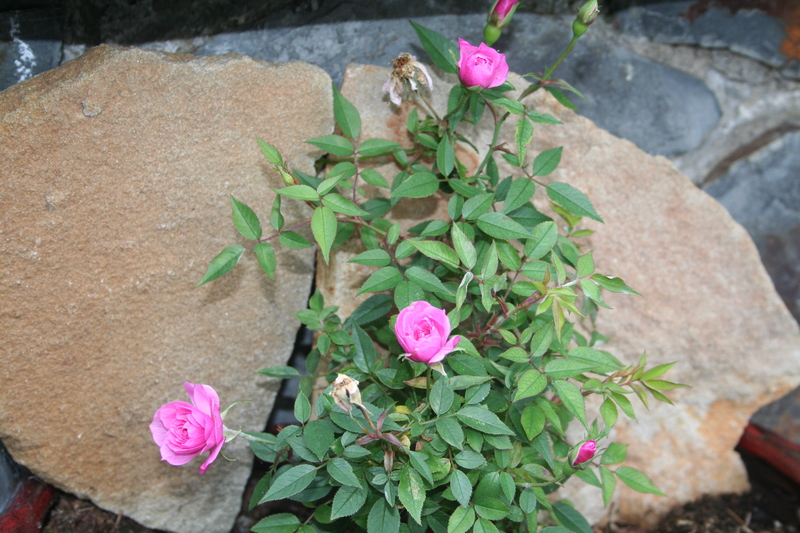 This rock, below, is the one that everyone inquires about. It’s obviously a Pyroclastic rock from a volcano somewhere or other. 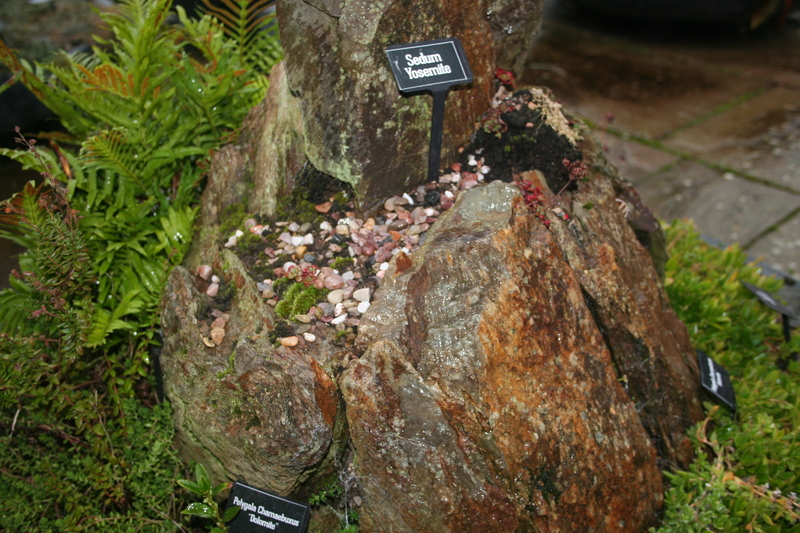 I actually bought this rock (I didn’t steal it) from a garden supplier who was closing down. The price I paid for a one ton builders’ bag of it was a steal, though. €50. 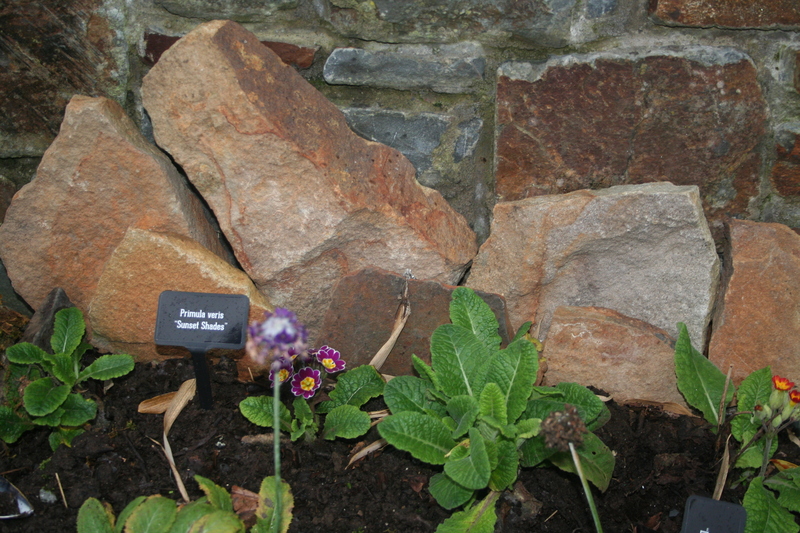 This below is Decaying Brown Shale from the Ballyhoura Mountains. 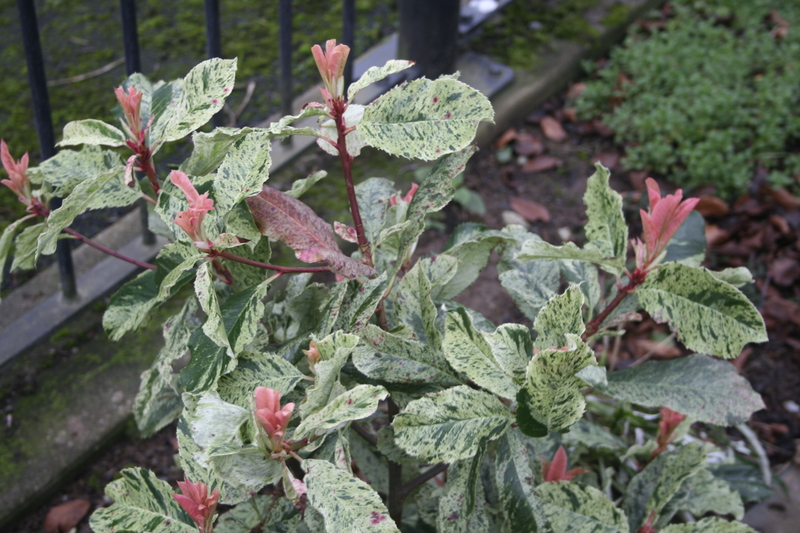 It’s slowly succumbing to frost and probably won’t have a long life now that it’s exposed to the elements. A lovely metamorphic rock. This is Slate from a slate mine up in the Tipperary hills. The mine is now full of water and scuba divers haven’t been able to reach the bottom of it, it’s so deep. It has been coloured with iron-rich water flowing through the slag heaps. 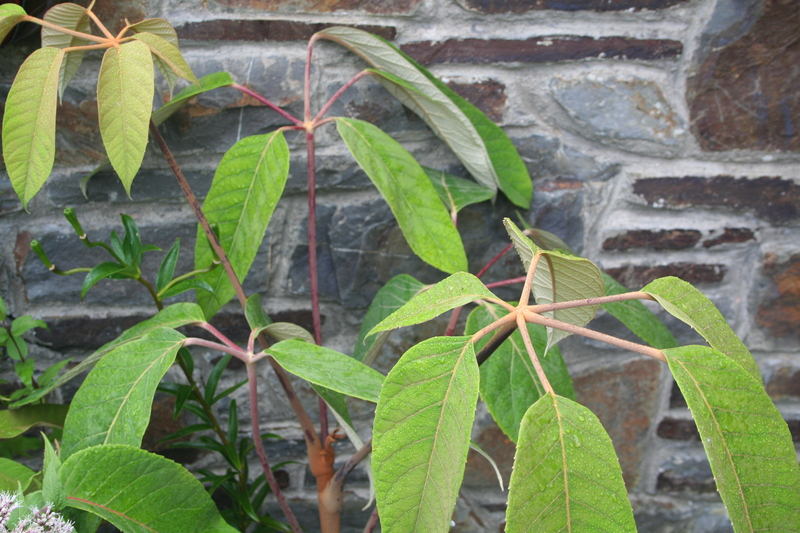 From Woodcock Hill in Co. Clare comes this Yellow Sandstone, which, in some cases,when exposed to air, bleaches to a pasty white. 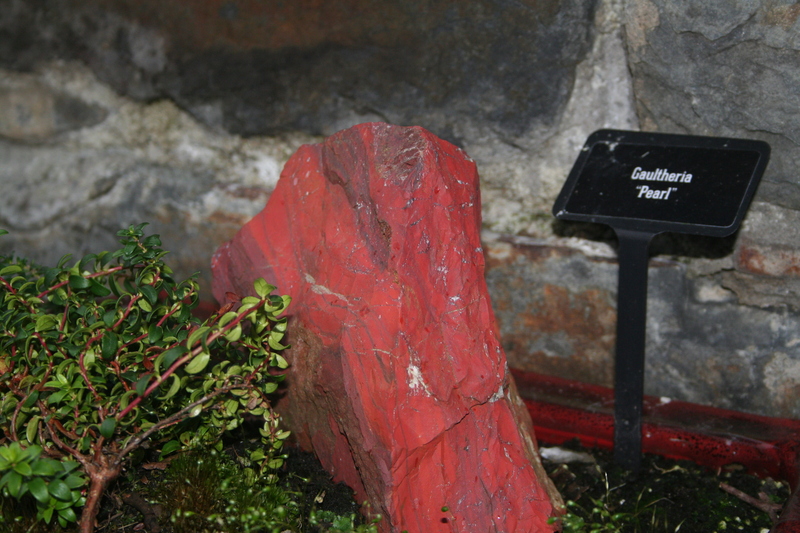 Namurian Shale from Castleisland. It’s actually blue but water from the bog over eons have stained it an ochre colour. 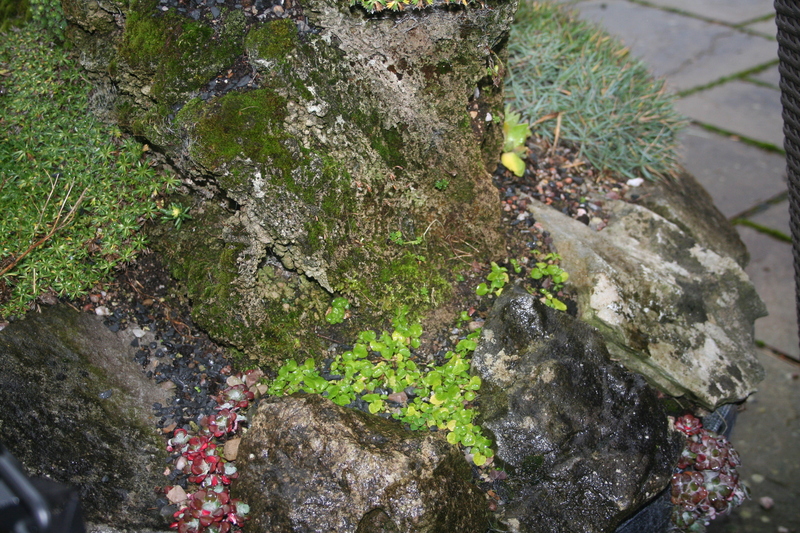 More Pyroclastic rock, probably a type of Scoria, with Lewisias inserted into the holes. Getting hold of this rock, Tufa, is like looking for hens’ teeth. Impossible to get here and I was very, very lucky when I found a few pieces. 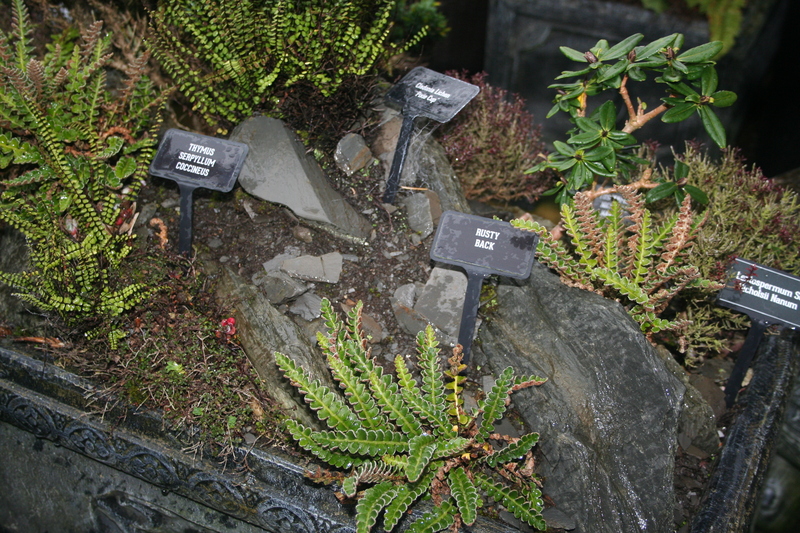 This very soft rock is formed when limey water flows over a bog or seeps out from acidic bedrock. 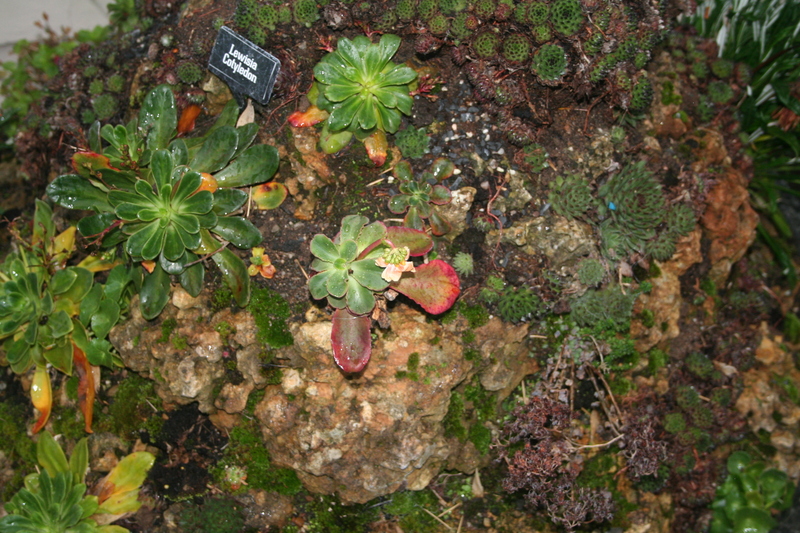 Carbon dioxide evaporates from the water and calcium carbonate is left covering the vegetation. 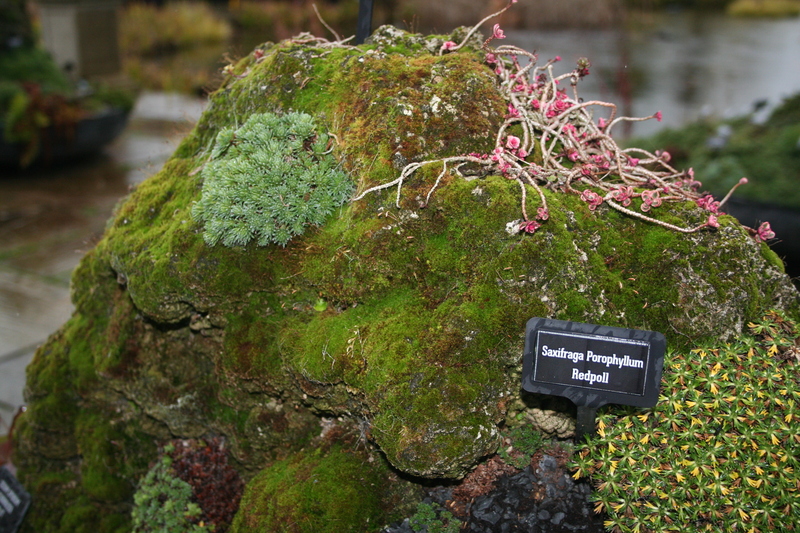 You’ll invariably find spagnum moss and similar inside the encrustation. 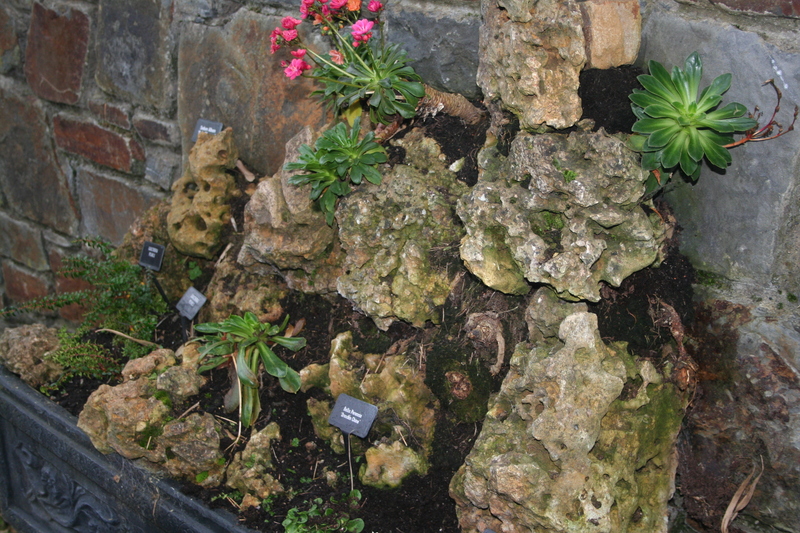 The amazing thing is that you can plant ericaceous plants in calcareous tufa and they do well! 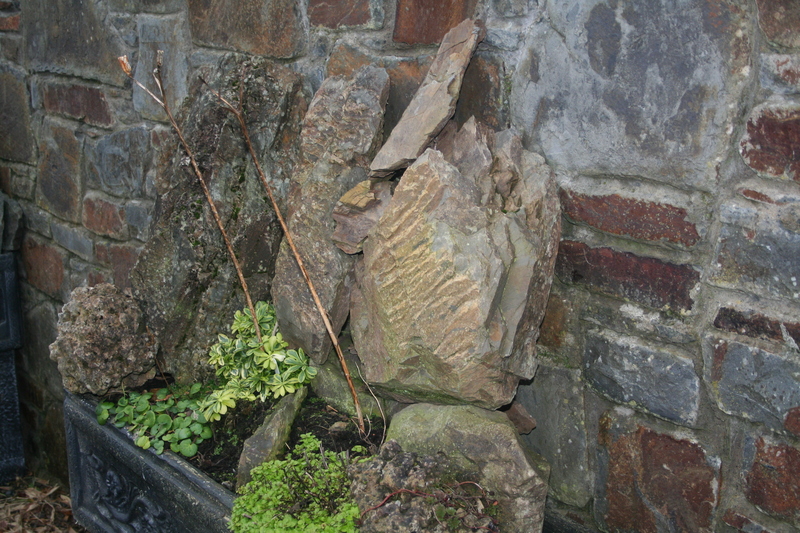 More decaying brown Shale from the Ballyhoura Mountains. Weathered Carboniferous Limestone from a farm approximately 3 miles away as the crow flies. When I get to the farm, I have to trot in about a mile across the fields to find the stone, which is randomly strewn around. Slate from the Graves of the Leinstermen, up on top of the mountain behind Ballina. A large piece of Carboniferous Limestone. 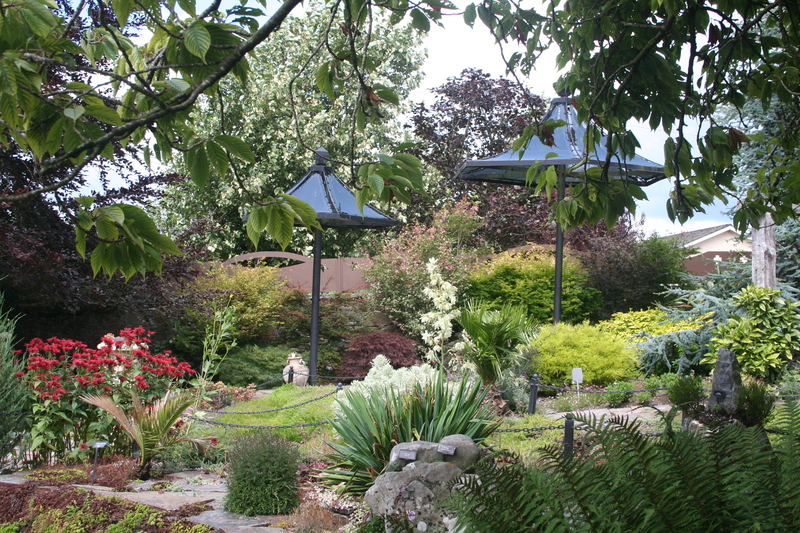 You can see the grykes in it, which I’ve planted plants into. 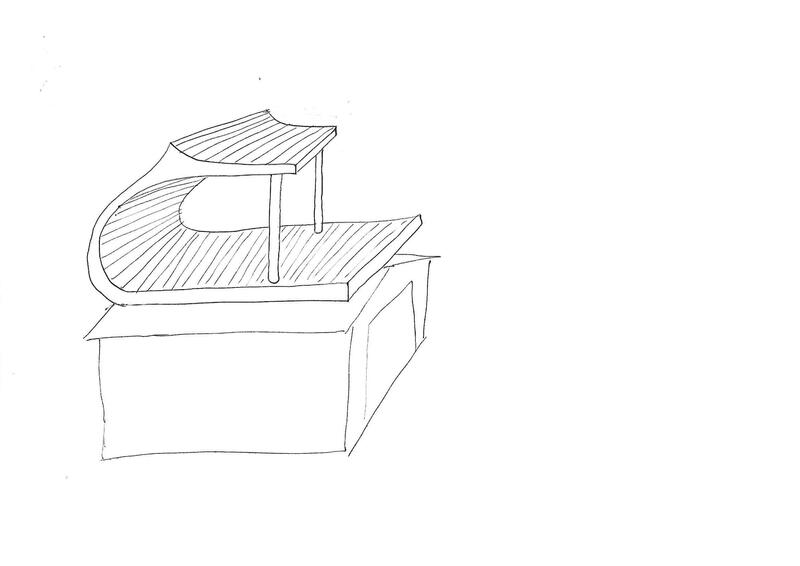 Plans are afoot to build viewing platforms in the sky. Well, not quite up in the sky but you know what I mean. 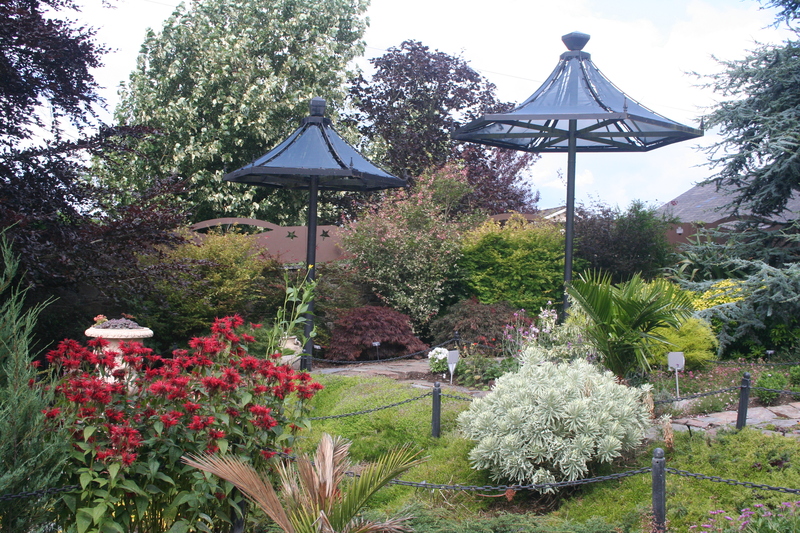 I haven’t a square inch of spare space in the garden to build two daises on the ground to view Rockstown Castle and Skule Hill, so they’ll have to be elevated to first floor level; one over a garage and the other on top of a wall. 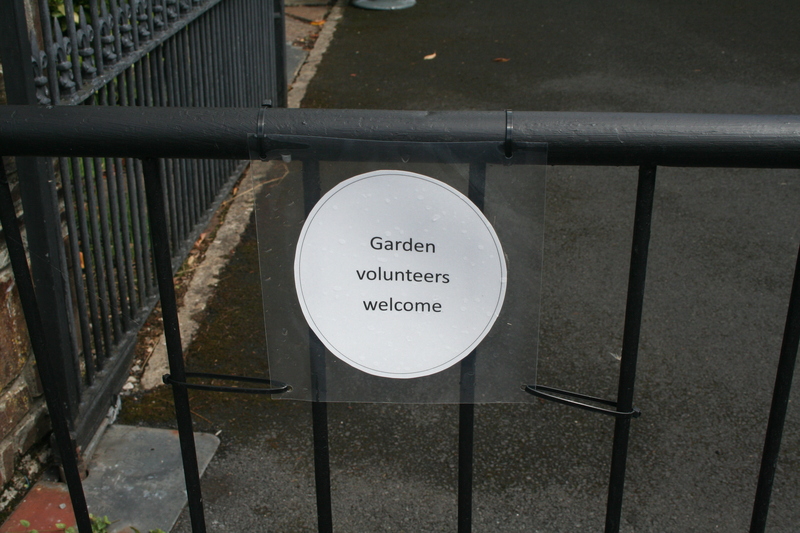 A corollary to this was that I was offered a greenhouse for free this week but had no room to put it anywhere. The picture above is an initial idea for the one over the garage but that design could well change before it’s actually built. I also have six Victorian cast irons columns, which I picked up recently, and they may well be incorporated into both platforms yet. After the drought in June and July, we eventually got a little rain in August; not much but enough to stop having our hoses on constantly. Pineapple lily & Yucca gloriosas. For the first time ever, most of our Kabschia saxifrages (now called Porphyrion saxes) were severely burnt by the intense sun we had this summer. 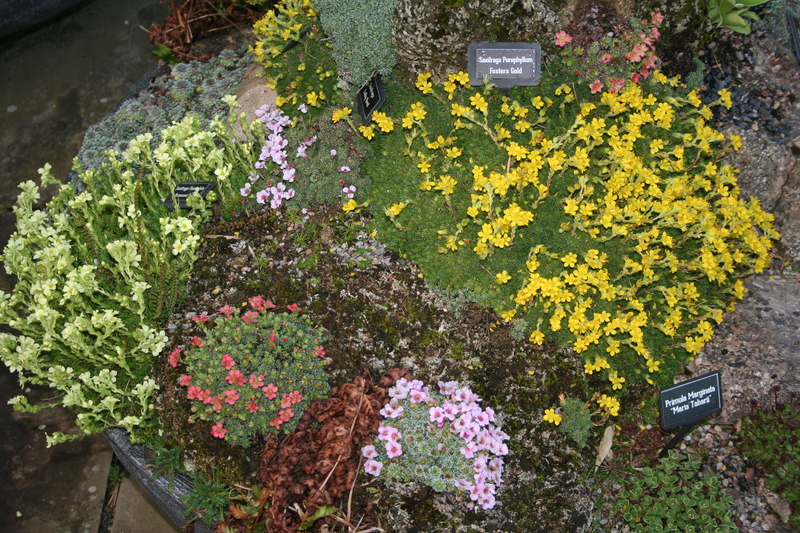 I’ve now moved quite a few of them into wall pots on a north facing wall, although we probably won’t get a summer like we’ve had this year for a long time to come. 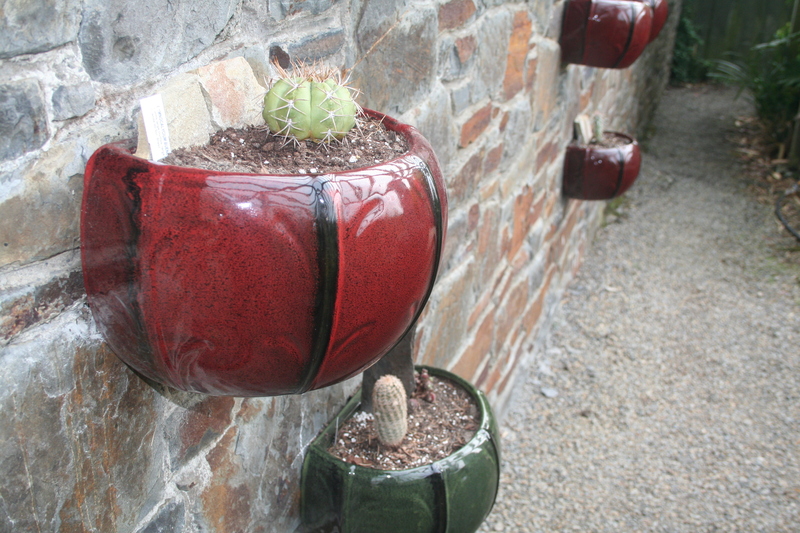 Wall pots have also been installed on a south facing wall under the glazed section of the pergola and I’ve put cacti in them to stay outside 12 months of the year as an experiment. 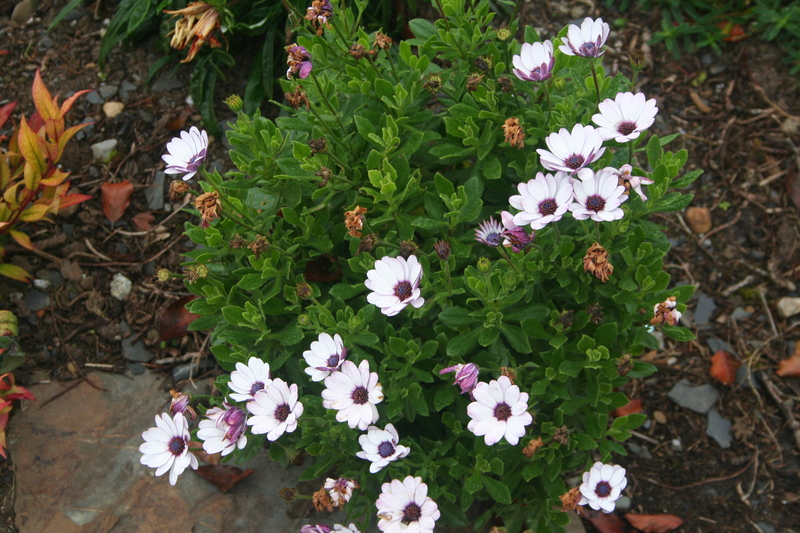 They’ll avoid winter wet but we’ll see if they can survive the cold. Nothing venture: nothing gain! 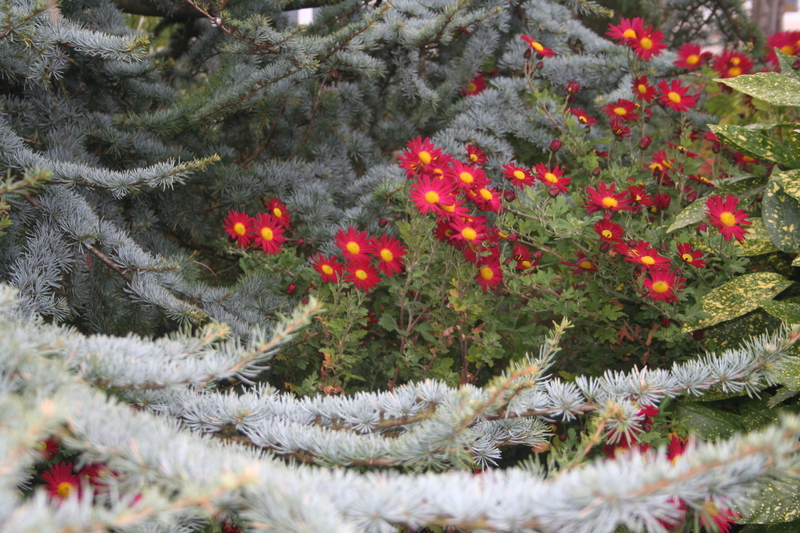 Cryptomeria with an ultimate? 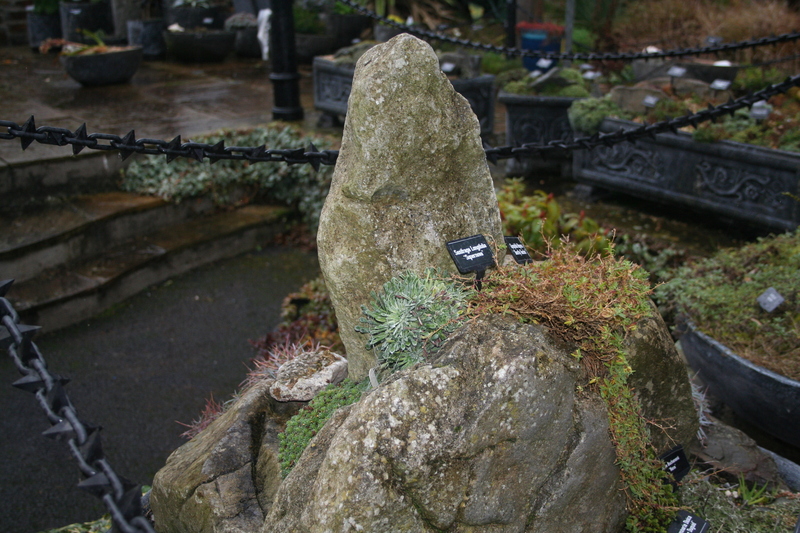 height of only 2½ metres. 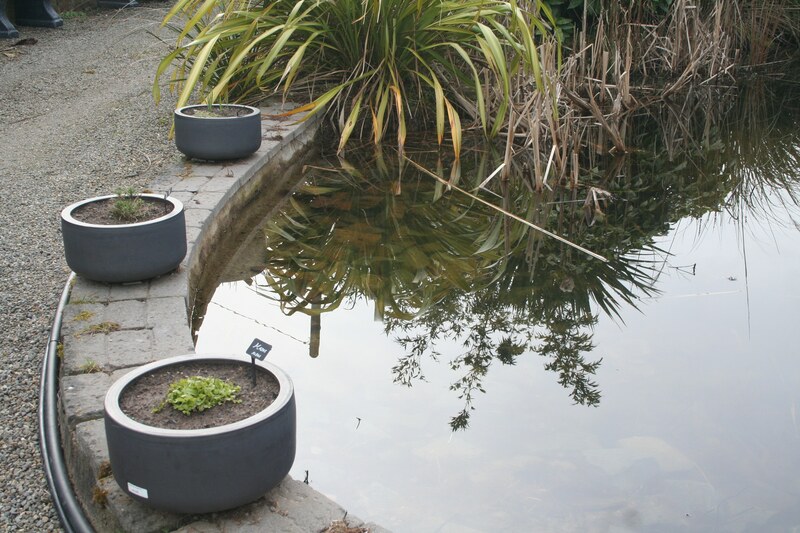 Our resident moorhens, who arrived here in the Spring and adopted the watergarden as a des res , are now causing quite a bit of damage. We used to have hundreds of sticklebacks; now we have none – all eaten. 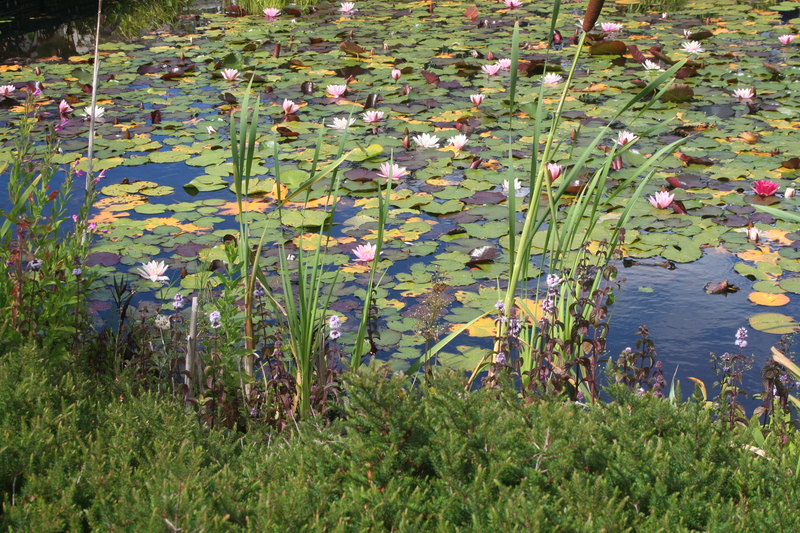 Their latest piece of chicanery is upturning our water lilies. 🙁 A cultivated garden and moorhens don’t appear to go hand in hand: we’ll see how it all pans out.